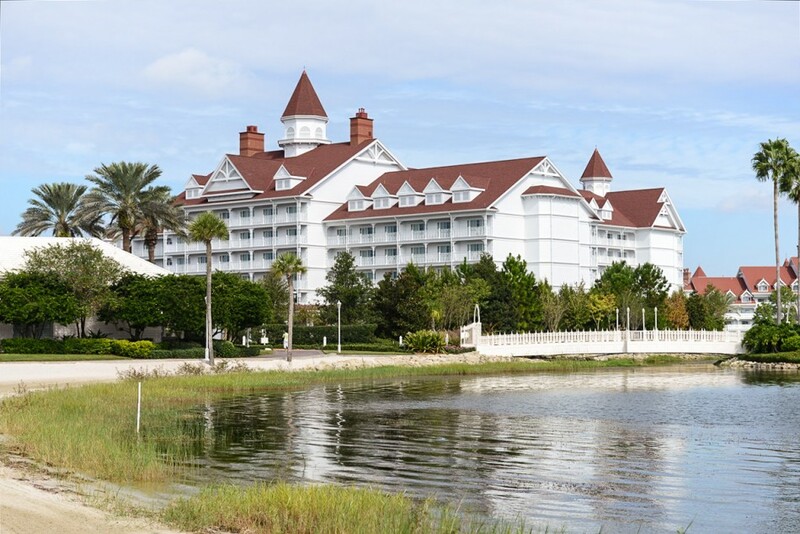 Disney Vacation Club has added luxury to its inventory of resorts. 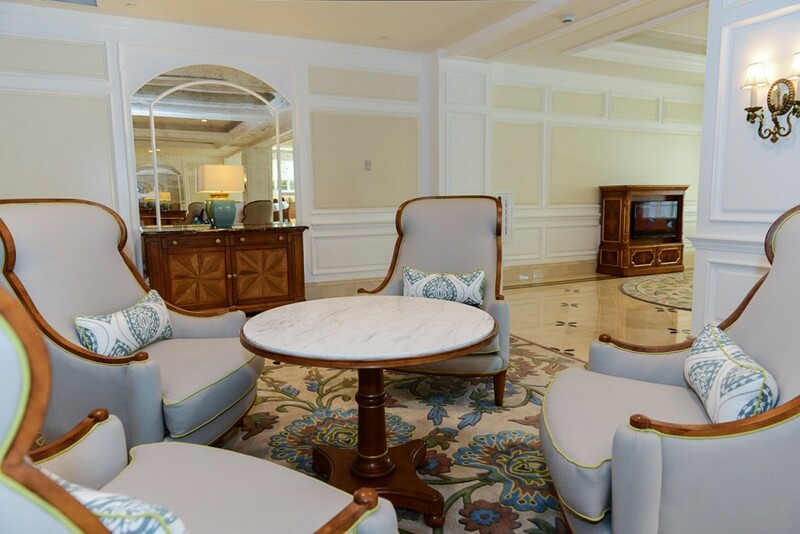 On Wednesday this week the Villas at Disney’s Grand Floridian Resort and Spa officially opened. I just happened to be at Walt Disney World so I took a stroll over from the Polynesian to check things out. 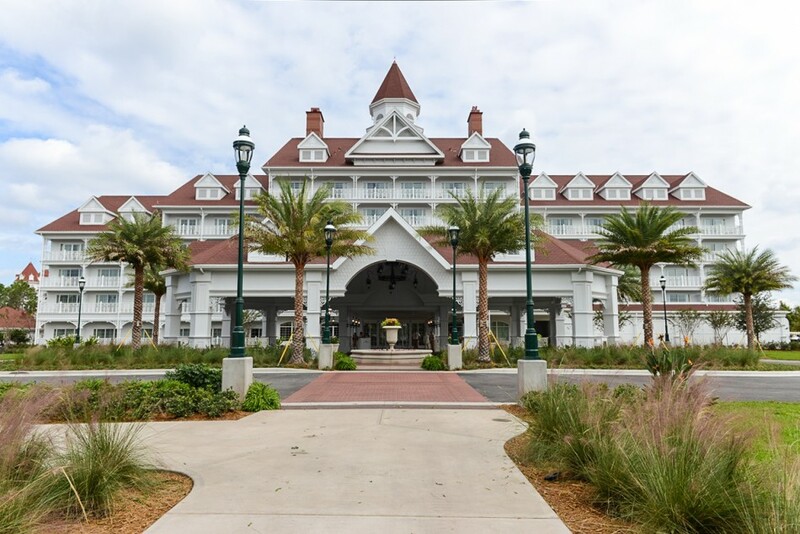 I’ve always liked wandering around the Grand Floridian Resort. It’s so pretty with its bright white Victorian buildings with red roofs and gables. 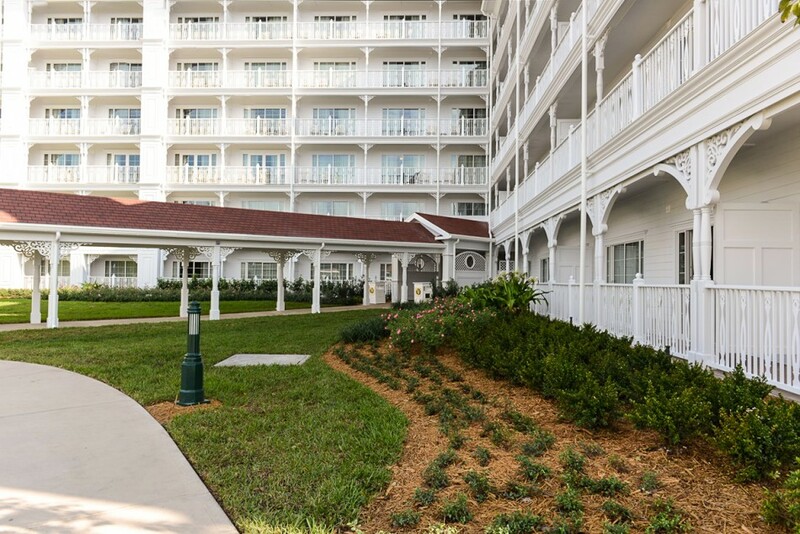 The new Disney Vacation Club building fits right in with the rest of the resort. On the opening day they had bell services set up in front of the resort, but this won’t be the norm. 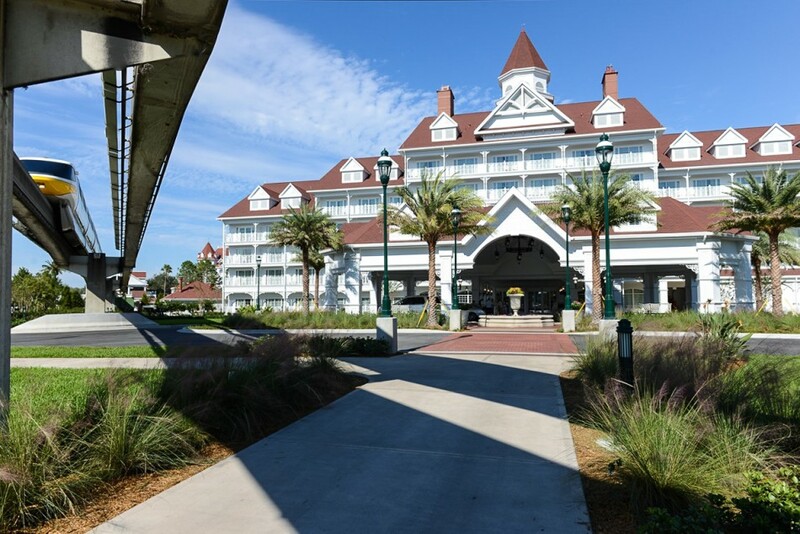 Guests can still use bell services but you will need to drop your luggage at the main building. 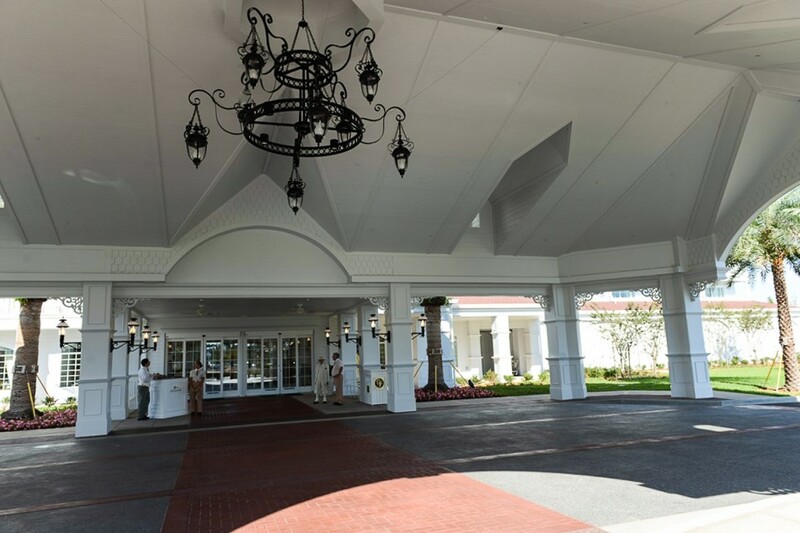 As you enter, you’ll find check in on the left. 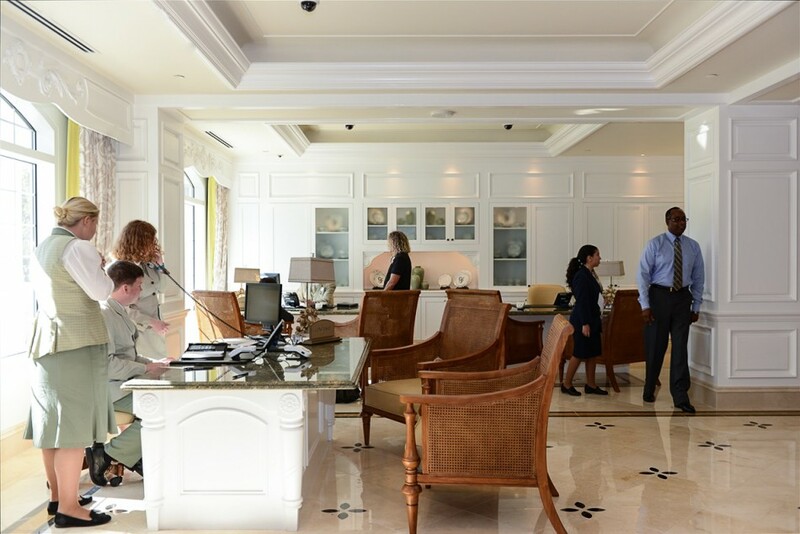 You won’t see the usual long check in desk. Instead, check in is done “concierge style”. I thought this was a very nice touch that makes you feel special right from the start. To the right as you enter is a seating area for children who would rather watch cartoons than listen to a bunch of adults talk about logistics. 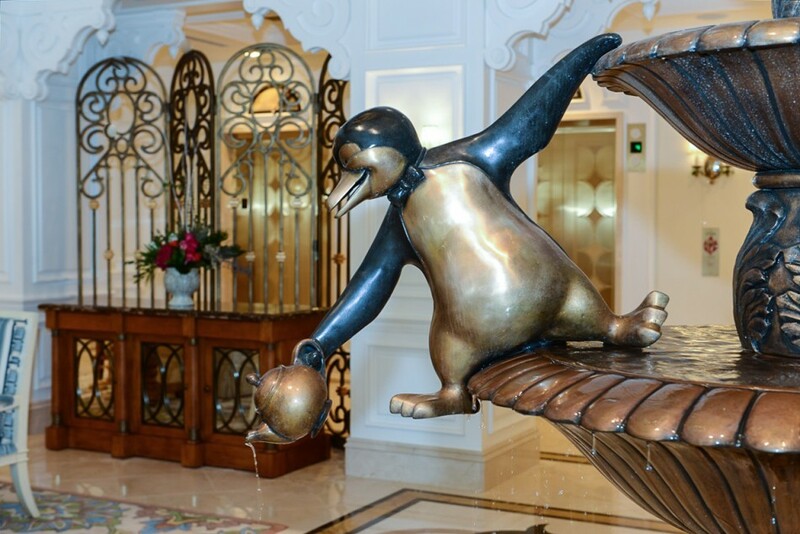 As you walk further into the lobby, the first thing you notice is a whimsical fountain with the penguins from Mary Poppins. 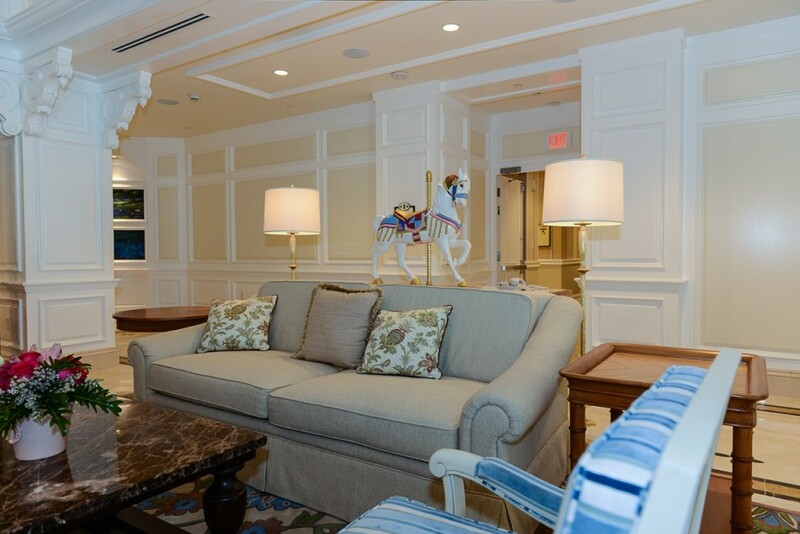 The Disney decor of this resort is subtle and refined. 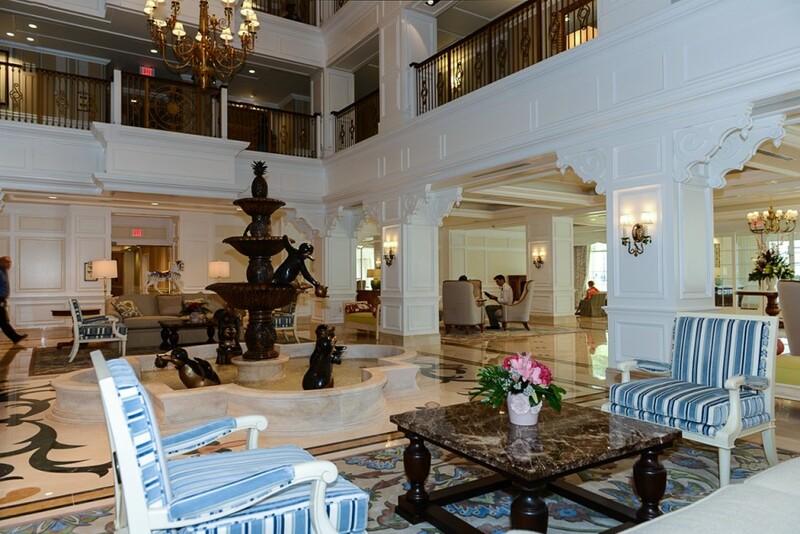 The Mary Poppins theme fits it to a T.
On either side, before you reach the fountain are a couple of seating areas. But who wants to sit when we can explore. Let’s have a closer look at that fountain. 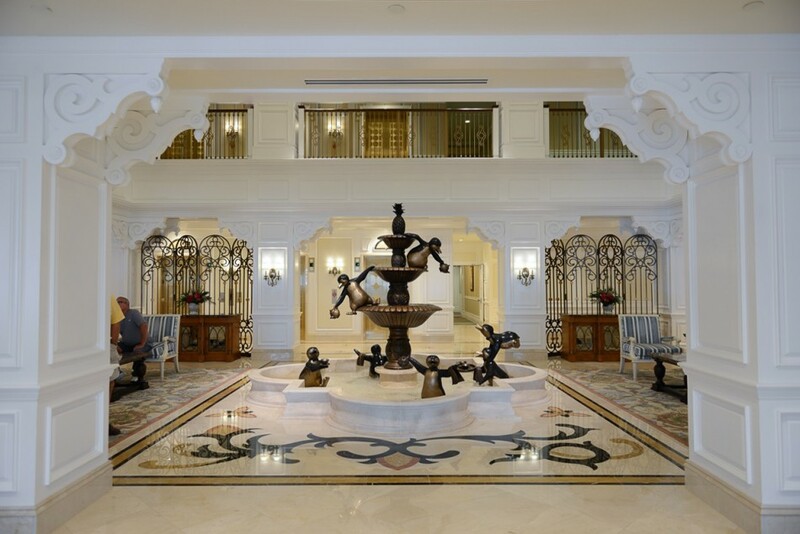 As you approach the fountain, prepare to be wowed! 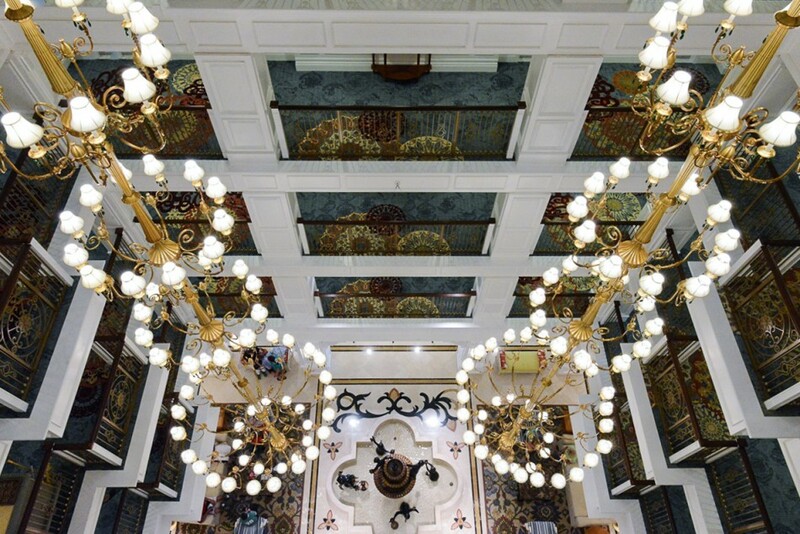 Above you are two magnificent chandeliers that are completely hidden from view until you step into this area. 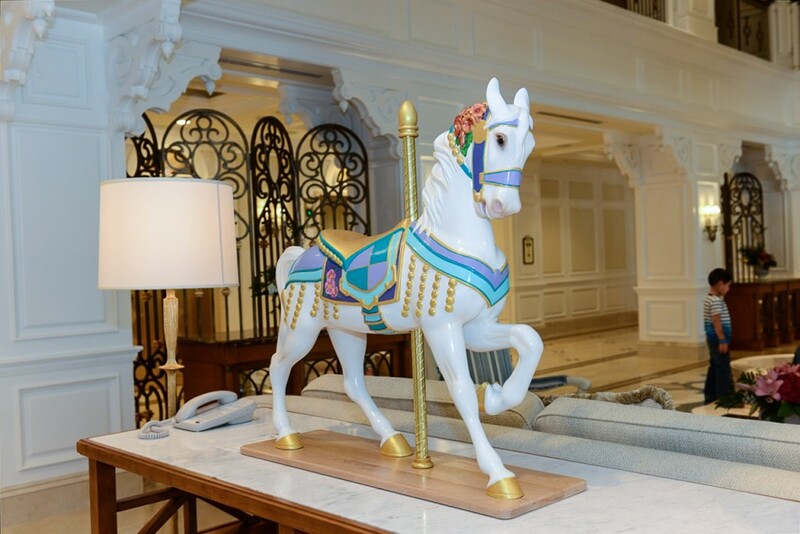 On either side of the fountain are two more seating areas, each flanked by carousel horses from Mary Poppins. Time to check out the view from above. 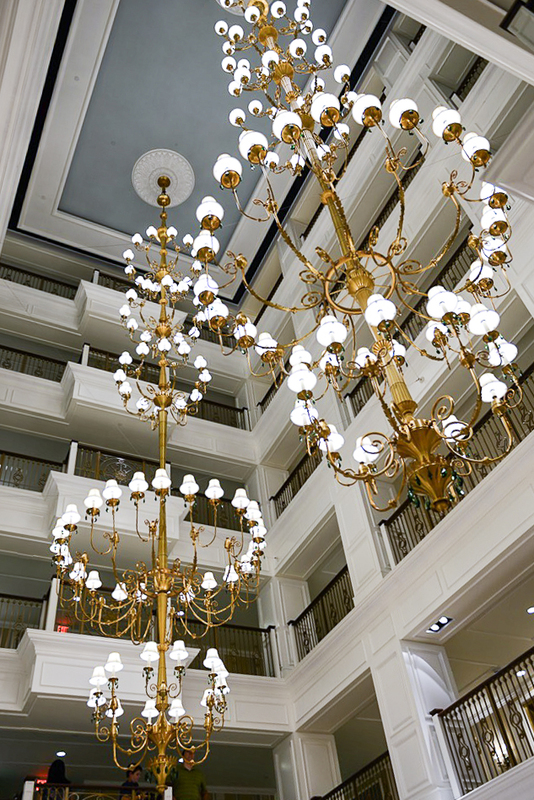 As you step off the elevator, be sure to look for the Mickeys in the carpet. 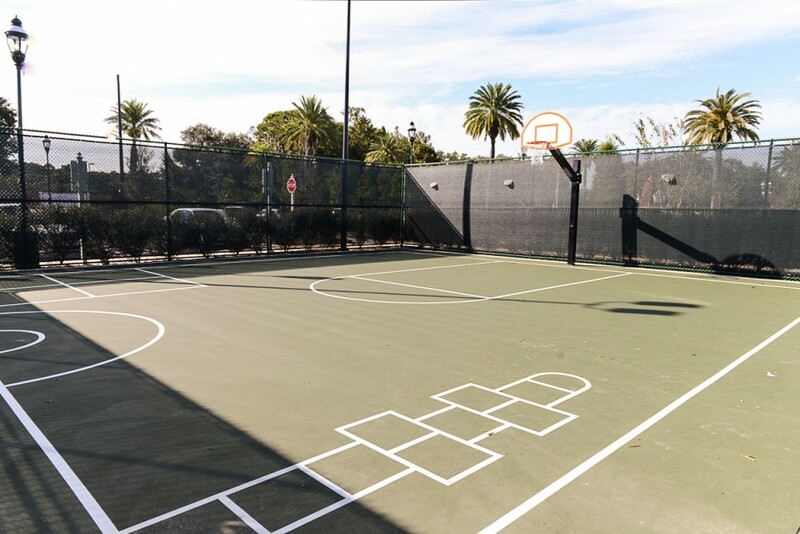 This resort is no different from any others in that respect. Now for my favorite view, looking over the rail. Ok, let’s go down a few floors before I make you dizzy. 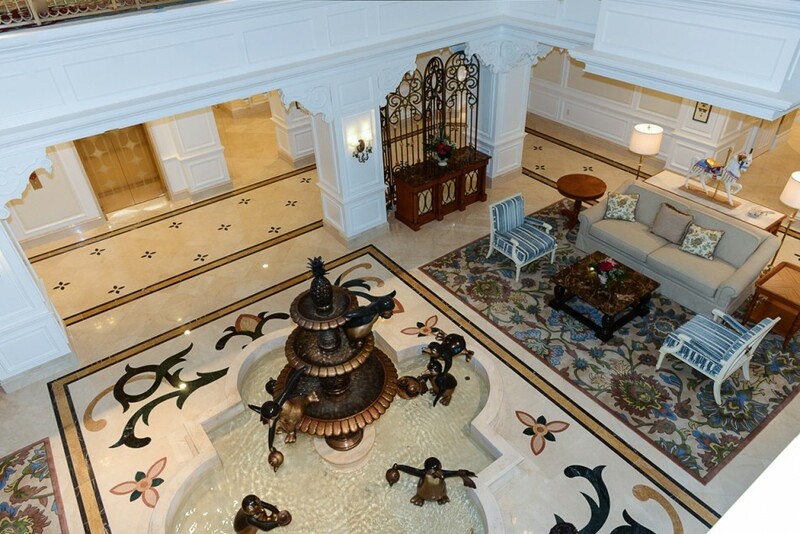 Look at the beautiful marble tile. 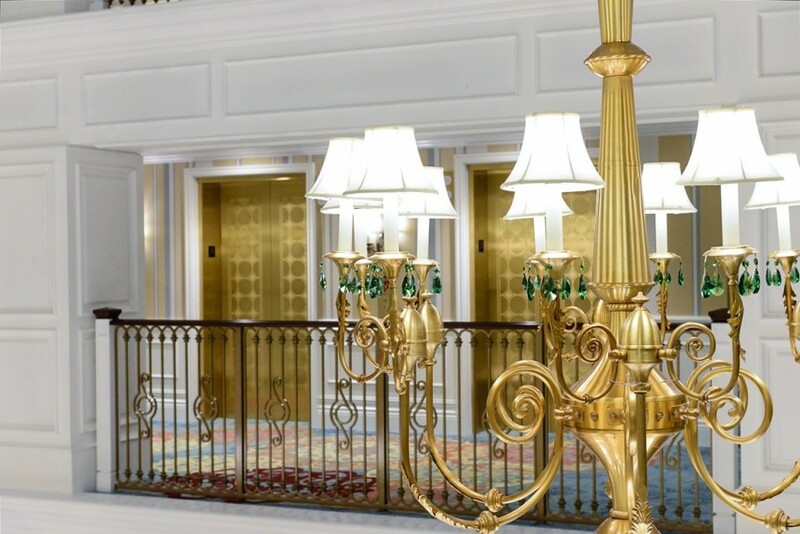 Let’s make our way back to the elevators so we can go see what the resort is like outside. 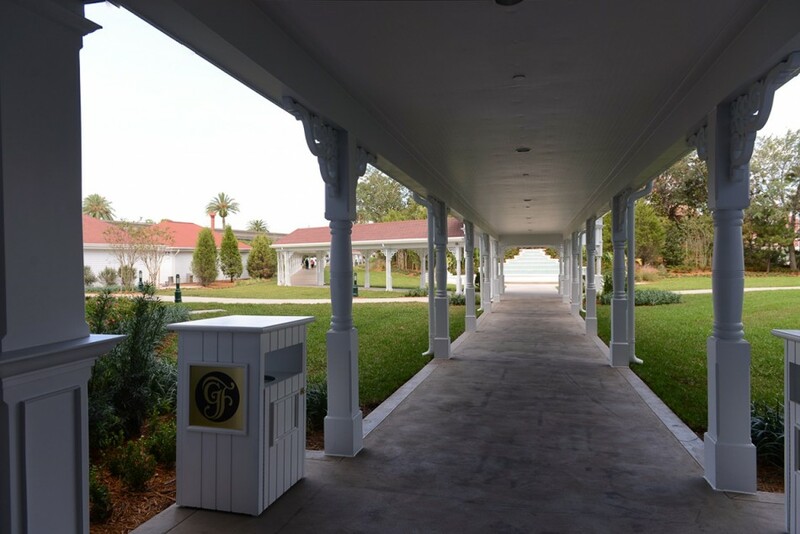 The exit at the rear of the building has a covered walkway that goes all the way to the front of the main Grand Floridian building. 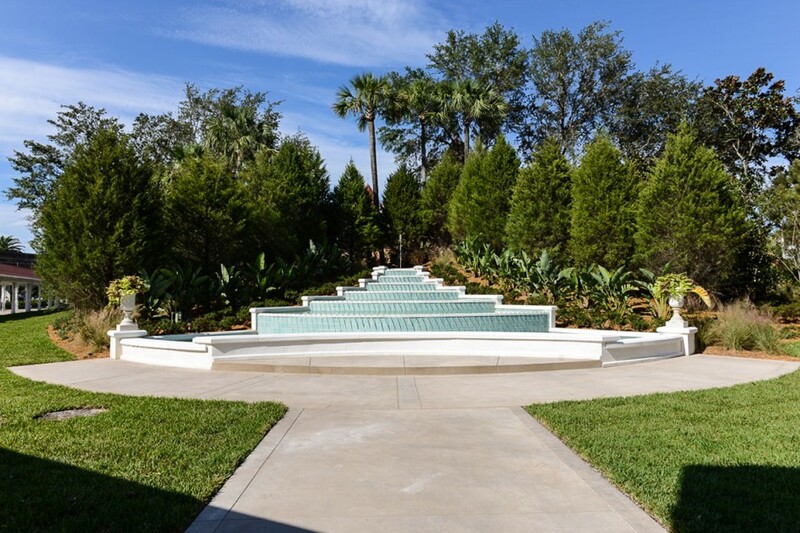 They’ve added a fountain to the back side of the pool’s waterfall. 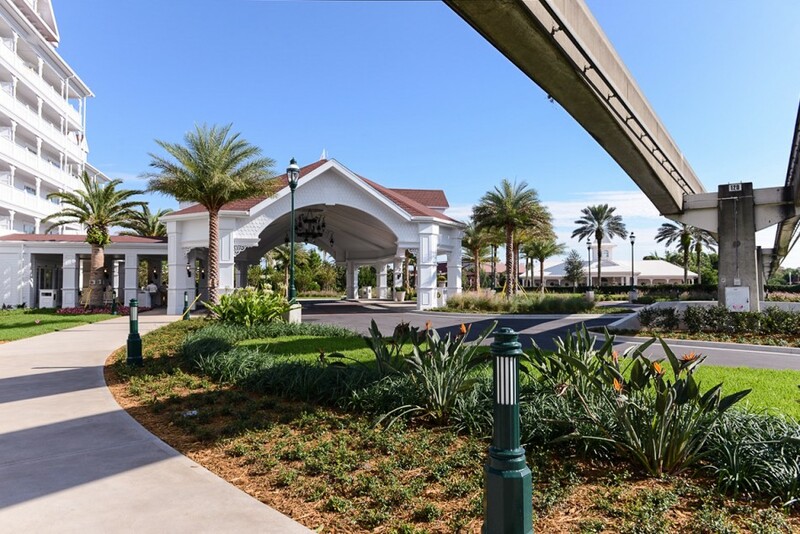 We’re going to take the path to the right, around to the pool. 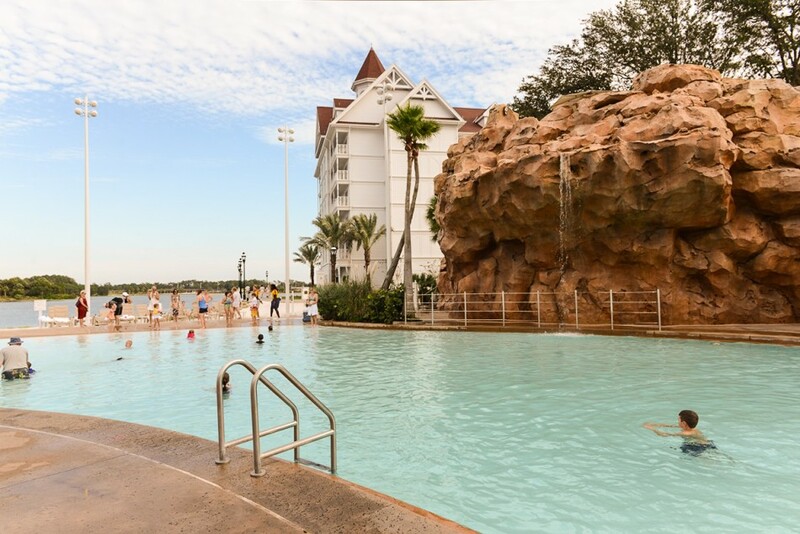 The pool nearest the DVC building is a zero entry pool with a waterfall. 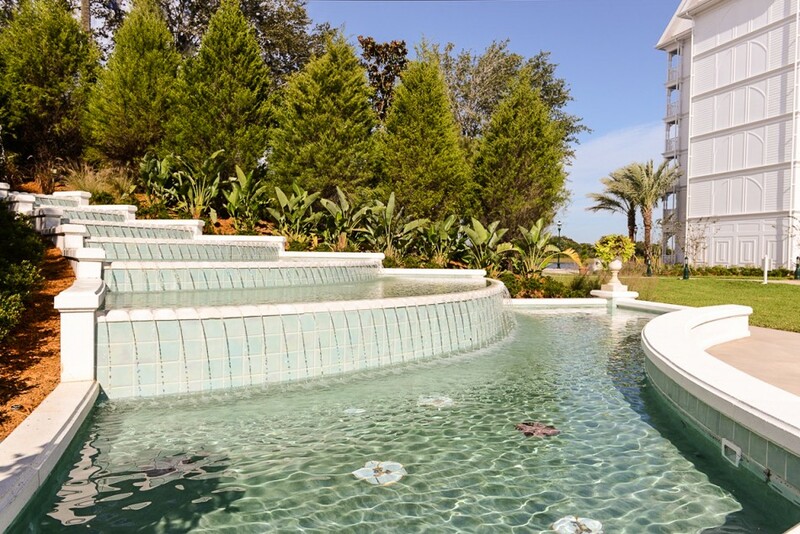 When you stay at the Villas, you can use the main pool as well. 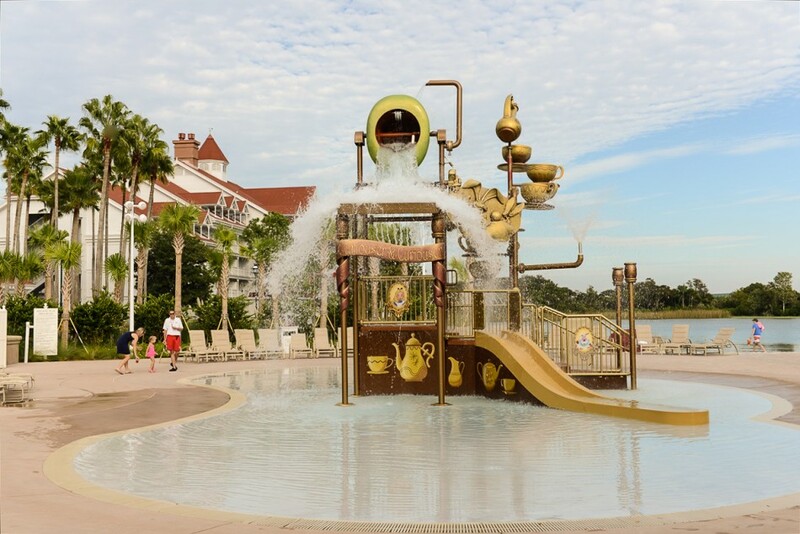 There’s a fantastic splash zone based on Alice in Wonderland. 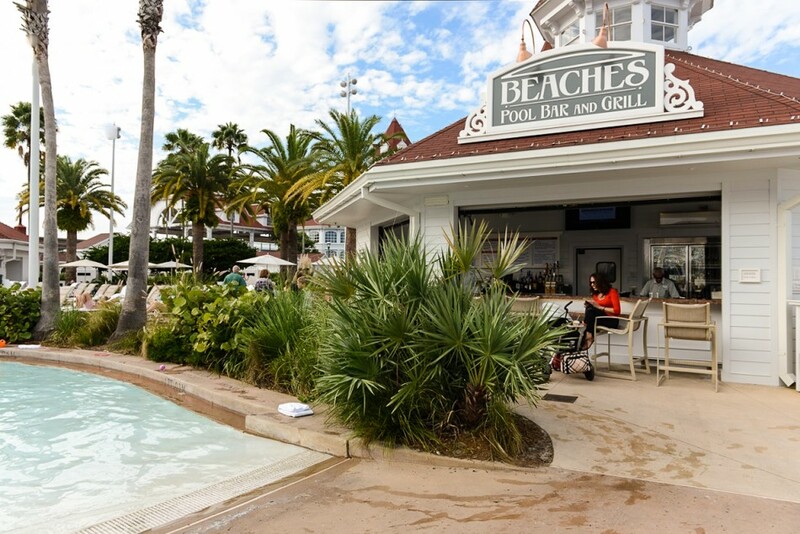 Beaches Pool Bar has a pretty nice menu of salads and sandwiches. The fire pit has a built in bench seat. Now let’s head back around to the front of the building. There are a few things there I want to show you. 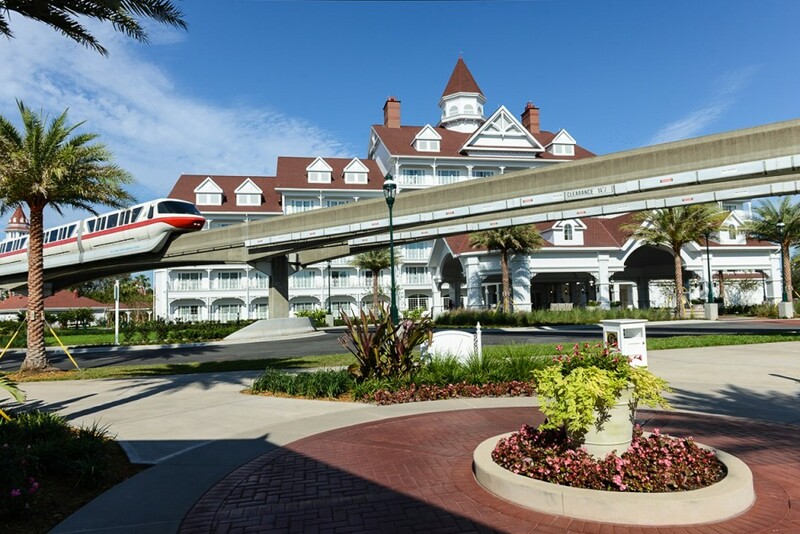 First, see that building between the porte-cochère and the monorail? That’s Senses Spa. 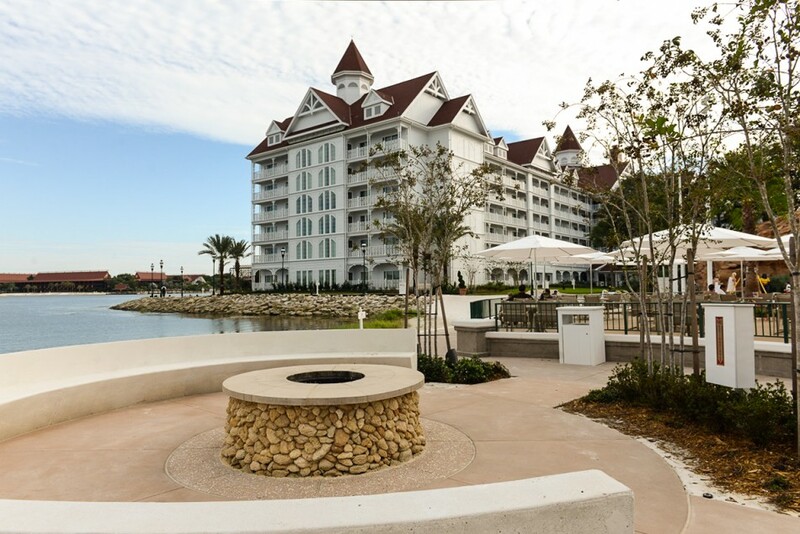 How nice to have it so close to the resort. 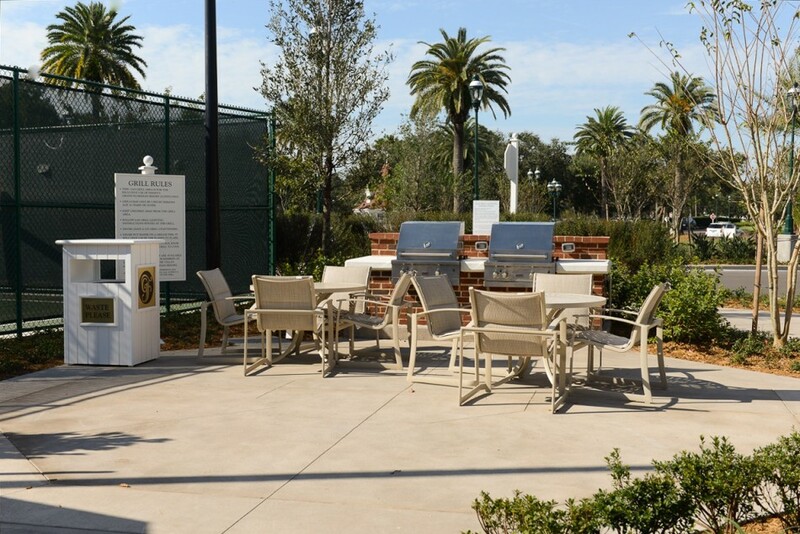 To the right of Senses is a barbecue area and sports court. 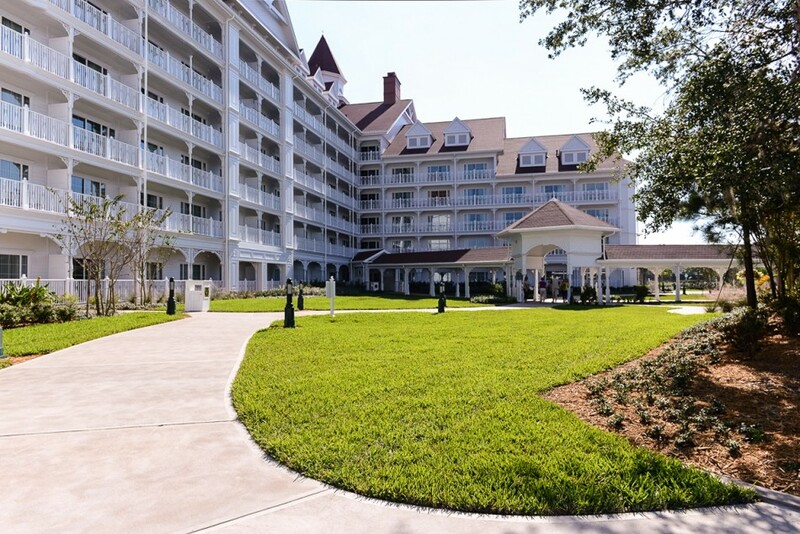 We’ve made it full circle, back to the front of the resort. 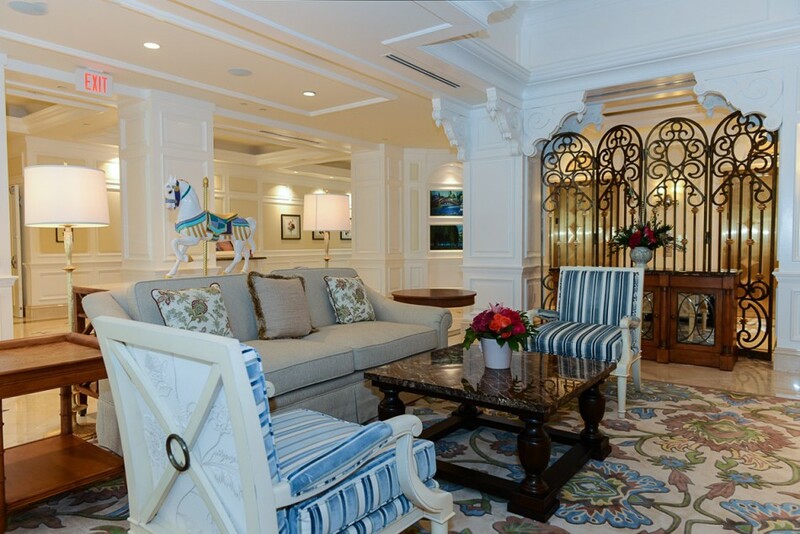 I love the elegant feel of this resort. 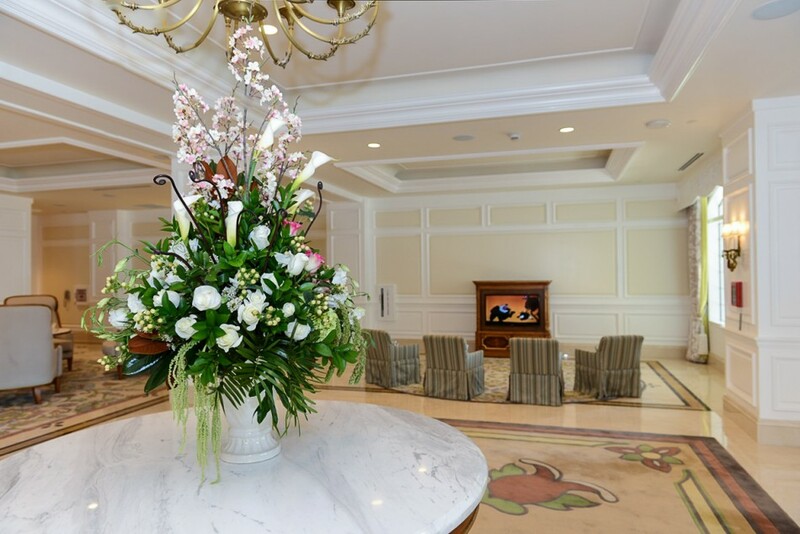 One young guest summed it up – as she entered the lobby I heard her exclaim, “Oh my gosh, we’re in a palace!” It is very posh, and I do like posh! Just wait until you see the rooms. I’ll be posting room photos on next week’s blog. 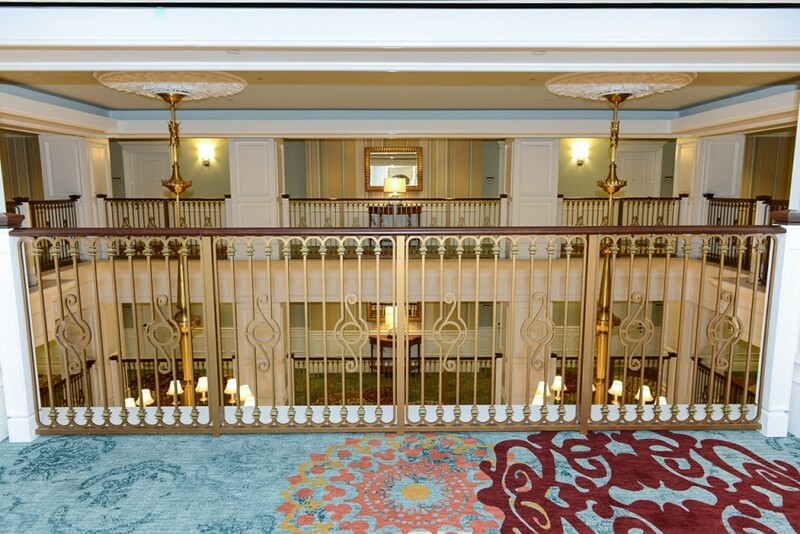 Be sure to come back to be wowed even more!